The Wagga Wagga Swimming Club Inc is one of the oldest Swimming Clubs in New South Wales, established in 1897. The Club would train down at the old Wagga Beach and swim against the current. Buoys marked the lanes and there was certainly no tumble turns at each end. Swimmers caught their breath as they floated back to the start with the current. 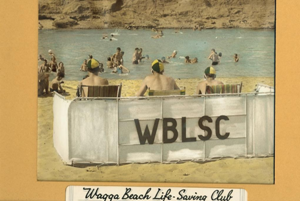 Lifesaving was incorporated into the Club's name (May 1991) because members of the Club would perform lifesaving duties at the Wagga Beach. The word Lifesaving was only removed recently (Sept 2008) to avoid public confusion as the club could no longer offer Learn to Swim classes or do Lifesaving duties (Both now supported by the Royal Lifesaving Society Australia NSW directly to the Oasis Aquatic Centre). The Club made the move from the river to the old pool in the late 1950s. The new pool (back then) provided a great training venue for the members especially with the growth of swimming after the 1956 Olympics. It was one of the only fifty-five yard pools left in the district before its demolition to make way for the new Aquatic Centre which opened in July 2003. The Club has been incorporated since 1985, and has been a Constituted Body throughout its history. At present the Club is building on past history by providing training for over three hundred members ranging in ages from five to over fifty. The season of 2002 was one of the only years in the Club's recent history where it has not had a training facility in which to train. For many years it provided a valued service to the community by conducting Learn to Swim classes at the start of each new season. This was done under the auspices of NSW Swimming. Since the Club has been able to resume year round training for the swimmers it has again become the premier Club in the South West District. To do this the Club has competed against other clubs such as Junee, Temora, Cootamundra, Young, Yass, Gundagai, Harden and West Wyalong to name a few. There has always been keen rivalry between the clubs especially with Junee. For many years the clubs would travel to each other's pools to compete for the Jack Pole Trophy. Jack was a butcher in the district and member of the Wagga club, while the Club's swimmers competed for the trophy it was also seen as a social event to bring the members together over a meal or tea and scones. Since the construction of the new Oasis Regional Aquatic Centre the Club has produced several State and National representatives and having been around for more than one hundred years is expected to continue to produce champion swimmers to wave the Wagga Wagga (City of all Sports) flag.